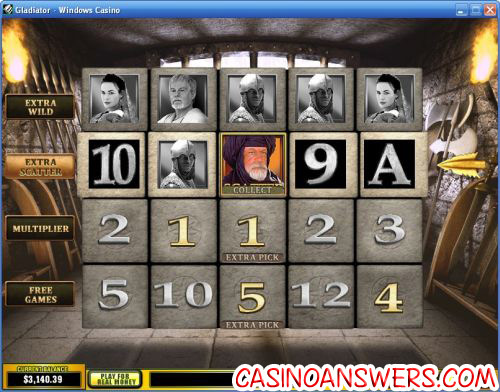 Gladiator Movie Video Slot Guide & Review - Casino Answers! Gladiator is a 5-reel, 25-line video slot developed by Playtech, featuring wild symbols, scatter wins, multipliers, a gamble feature, free spins, a bonus game and much more. You can play the Gladiator Playtech video slot at Omni Casino and Titan Casino. 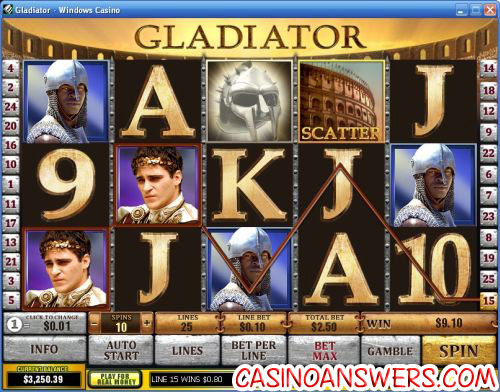 To play the Gladiator video slot, you will first want to select a coin size of $0.01, $0.05, $0.10, $0.25, $0.50, $1, $2 or $5. Once that is selected, you will be able to select the number of paylines you wish to play (up to 25) and the line bet (up to 10 coins or 10X your coin size). The lowest total bet you can make on the Gladiator movie slot is $0.01. The highest total bet is $1250 per spin. With an incredible betting range such as this, we can’t imagine anyone not being able to find an ideal wager. To play all 25 lines and 10 coins, use the “Bet Max” button. Otherwise, use the “Spin” button to play Gladiator. To win the 5000 coin top jackpot on the Gladiator slot game, you must hit 5 Emperor Commodus symbols on a selected payline. The Lucilla symbol is the next highest paying symbol at 1000X your line bet if you hit 5 symbols. The wild symbol is the Gladiator symbol. It only appears on reels 2, 3 and 4 and will substitute for all symbols except for the Coliseum scatter symbol. If you hit 3 Gladiator symbols, you will trigger the Gladiator bonus. The game will pick nine random helmets of different prize values (either gold, silver or bronze). All helmet wins are then added up. Gladiator’s scatter symbol is the Coliseum symbol. You only need two of these symbols to pay 1X your total bet all the way up to 100X for five. Three Coliseum symbols will trigger the Coliseum bonus game. The bonus game consists of four rows. In the first row, you will pick how many free spins you will receive. The second row will determine your multiplier. The third row will give you an extra scatter symbol. Finally, the fourth row contains extra wild symbols. For each of these picks, you will win a prize and one of four options; collect all prizes in the column, pick another prize in the row above, pick another prize in the same row and collect the prize and continue to the free spins. The Coliseum bonus game cannot be re-triggered during free spins. If you get the Commodus symbol on reel 3 during free spins, you will be awarded an additional 3 free spins. After any win on the Gladiator slot game, you can use the “Gamble” button to activate the gamble feature. By choosing which colour the facedown card will be, you can double your winnings. You can play up to the double up limit listed in the casino’s paytable. Use the “Collect” button to exit the gamble feature and return to the regular slot game. There are more in-game features on the Gladiator slot machine. There is a basic autoplay mode where you can play up to 99 autoplay spins. You may cancel the autoplay mode at any time. There is also a skill stop feature that can be used to manually stop the reels during a spin. The Gladiator video slot is a lot of what we have come to expect from Playtech. Russell Crowe may be nowhere to be found, but the video slot does have a theme moviegoers are familiar with, a good selection of special features and solid gameplay. You can play Gladiator with a 100% up to $100 signup bonus and $200 reload bonus when you sign up and deposit at Omni Casino! Are USA players able to play the Gladiator video slot for real money? Unfortunately, American players are out of luck if they’re looking to play Gladiator at any Playtech casino. While we can’t direct you to another film-themed video slot, you can play the Caesar’s Empire video slot at the US-friendly Rushmore Casino. Where can I play a Flash game of the Gladiator slot for free? Instant Play Flash version of the Gladiator video slot are available at both Omni Casino and Titan Casino. If you’re using a Mac, you will be unable to download the casino software, so this is the only way for you to play this video slot. You can play for real money or for free. If you experience any difficulties with the Flash game, try installing the latest version of Adobe Flash Player. Why is Russell Crowe not in the Gladiator video slot? Playtech has never offered an answer to this question. We imagine Russell Crowe has a clause written in his contract to prevent his image to be used without his permission. Where can I play other video slots based on movies? For more movie slot reviews, please read our Forrest Gump Video Slot Review, Braveheart Video Slot Review, Rocky Video Slot Review and Pink Panther Video Slot Review. If it’s movie slots you want, check out all of the video slots that are based on films on our list of movie-themed slots. We also have reviews for many different comic book movies listed in our Marvel and DC Comic Book Slots article. If it’s movie slots you want, check out all of the video slots that are based on films on our list of movie-themed slots. What is the difference between the Gladiator video slot Playtech and the one from Microgaming? There are many differences, but the main difference is the Playtech version is based on the movie. If you are looking for that video slot, you can also read our Microgaming Gladiator Video Slot Review. Where can I find the payouts to the Gladiator Slot Machine?